Yesterday my family watched the Macy's Thanksgiving Parade from the comfort of our home. We enjoyed the Hawaii All State band, representing 47 high schools. The band was followed by a Hawaiian themed float sponsored by King's Hawaiian Rolls. Yum, Yum! NORTH POLE — Yes, Virginia, there is a Santa Claus — and the U.S. Postal Service can help you prove it when Santa replies to your child’s letter — complete with a North Pole postmark. 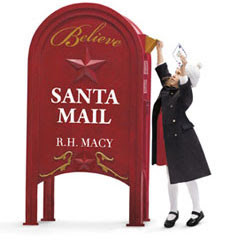 “Letters from Santa” must be received by the Anchorage, AK, postmaster no later than Dec. 15. Santa’s helpers at the Postal Service will take care of the rest. Learn more about this program, including tips, at this link. Let's not forget deployed personnel! I have a list of men and women who would like to receive holiday cheer! You can send cards to individuals ... or a units of varying sizes. Please contact me for the mailing list and helpful hints at sos.aloha@yahoo.com. 1. Leave a comment about holiday cards - when do you start writing them? Do you include a "recap" letter? Family photo? Or something else? We write a "recap" letter, set it aside, and remember to send the cards after Christmas. 2. Comments are open through Sunday, November 27, 10 pm in Baltimore. 3. I'll post the winner on Monday, November 28.
in 2014 on my travel blog at this link. I have not sent out cards in years. It's a dying art I'm afraid. I just send out the cards to a few. I send out cards every year. I send them to service men and women as well. Hi Kim - I try to send the cards out early, but it doesn't always happen! I usually send out about 50 - 60 cards. We sent a letter for years, but stopped a few years back. We still send cards to a select group of family and friends. My list keeps getting smaller and smaller, partially because so many just don't seem to send them anymore . I usually get them done a couple of weeks before Christmas. I occasionally send out personal handwritten cards to long-distance friends, I think it's a nice touch even if I can easily reach out to them via text message or Facebook. My family has never participated in the annual distribution of family recaps, but we do receive a several each year from family friends. I think it's a nice way to keep up with people we don't talk to on a regular basis! Time often flies around the holiday, so I haven't gotten cards out the last few years - I'm ahead of things this year, so maybe I'll get some out. I send cards all through December. I don't do pictures or a letter. I used to write extensive letters in all of our cards and get them out the week after Thanksgiving. Now I am lucky to get any cards out at all. This year we are considering doing our first "re-cap" letter and getting cards out this year. I sincerely doubt that will happen. We are working on the Holiday Mail for Heroes and that will take a lot of our time the next few weeks. The first batch of cards need to be delivered to some of the Guard and Reserve units next weekend and the rest the following weekend. After that, we will make sure we get cards delivered to the nursing homes and senior facilities in our 13 counties. This is a busy time for us with the Red Cross from Veterans Day through Christmas. The Christmas activities and fire responses, (we had two Thanksgiving Day - one at 12:30 am that morning and one that following 1am.). Forgot my Santa mail story. My husband is a retired postal clerk. He got his share of letters addressed to Santa delivered by kids for him to mail out. We bought a large North Pole Mail cancellation stamp and if he knew the family or there was a return address, we would write a letter back to the child, stamp it, and mail it to them. Just a little effort that made a few children very happy. I usually start my cards after my birthday at the start of December and depending on who I"m sending it to, they'll get a letter with more info. But as the years go by, I send less cards, just to those who are really important in my life. I tried to get my cards done by the 15th......no family letter. I sent cards every holiday for over 45 years. Now I send about a third of the the cards I used too. I have my cards out, I just hope that I don't procrastinate too long to get them out BEFORE Christmas! I try to get my cards sent out a week or two after Thanksgiving, and I write letters to those I'm really close to.